If you had to put a word to Apple’s first big MacBook reveal in, well, years, it would have to be meh. Sure, you think I’m just throwing shade at Apple because I’m the original hater, but frankly I expected more after four years of neglecting the MacBook Pro lineup. I really expected Apple to knock it out of the park and show the PC world the bottom of its sneakers as it raced ahead. But no. Apple has not raised the bar. Worse, in plenty of metrics, the PC remains ahead. Don’t believe me? Let’s break it down. 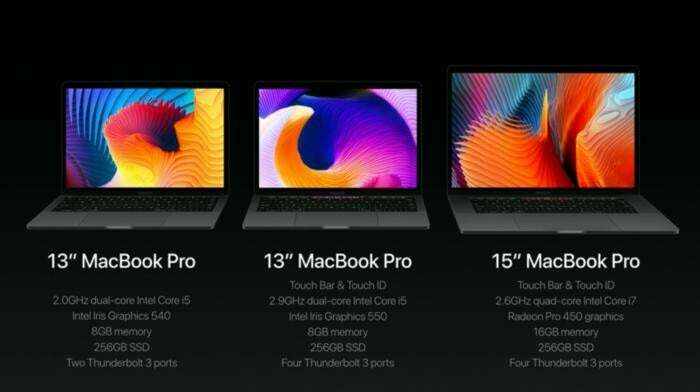 Apple’s three new MacBook Pros: Are they what Mac users really want as their workhorse? Apple announced three new laptops today. The most high-profile is the workhorse of the fleet: the MacBook Pro 15. As usual, Apple didn’t divulge all the specifics, such as the exact CPUs, but it did disclose the clock speeds and the generation of Intel CPU. 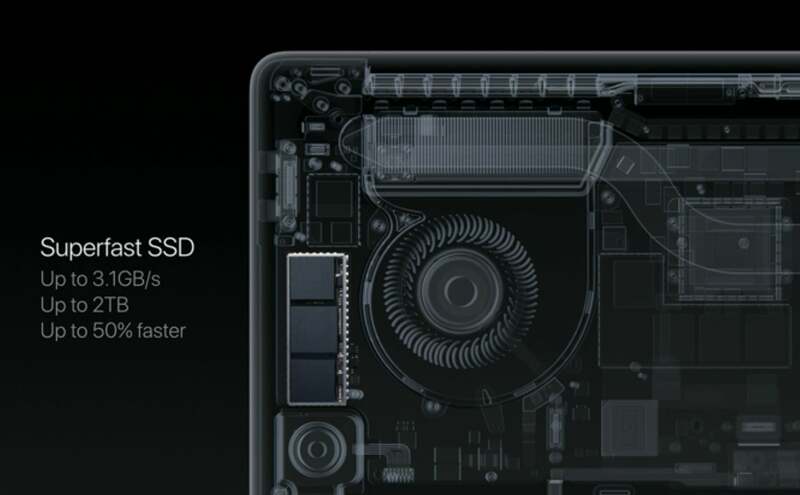 The MBP15 uses a 6th-gen quad-core Skylake chip. This may disappoint some, but Intel’s 7th-gen quad-core Kaby Lake CPUs aren’t official until early next year. Apple does stick with the beefier versions of the Skylake CPUs, with Iris Pro graphics. By process of elimination, I’m pretty certain these are the two CPUs in the MacBook Pro: the Core i7-6870HQ and the Core i7-6770HQ. Read all about them at Intel’s ARK. Both of them are pretty decent CPUs and feature Intel’s Iris Pro 580 graphics, as well as 128MB of integrated eDRAM. The MacBook Pro 15 packs soldered-in-place CPU and GPU. Graphics-wise, the Iris Pro 580 is Intel’s best—but it still falls short of decent discrete graphics. In performance, it’s roughly between that of a GeForce GT 940M and a GeForce GTX 950M, which aren’t exactly fast GPUs themselves. In CPU-limited tests, the new MacBook Pro 15 should be about the equal of a quad-core PC. What I don’t get is why Apple uses the pricier Iris Pro version of the CPU even when it’s paired with discrete graphics. Why not shave a little money off the price tag? 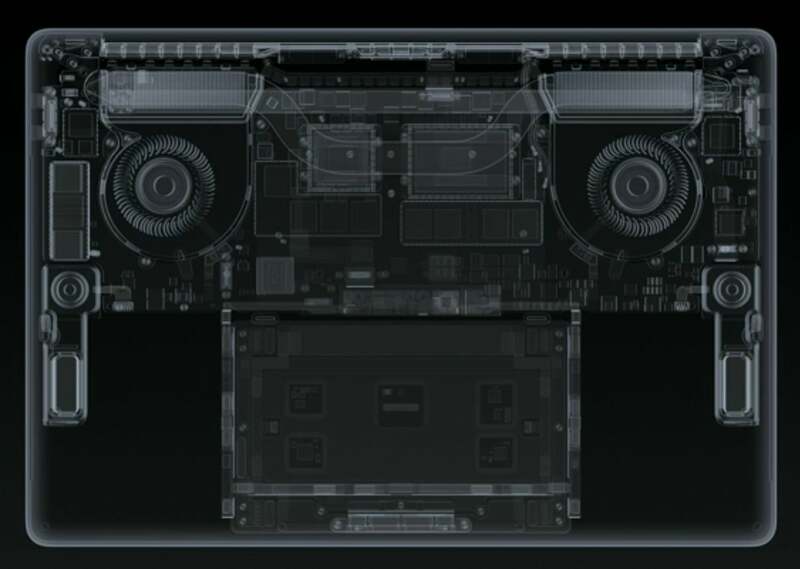 Speaking of GPUs, Apple is the first personal computer vendor I know of to offer AMD’s new lower-end Polaris GPUs in the form of the Radeon Pro 450 and Radeon Pro 455. Both are pretty power-friendly, with a rating of 35 watts, but neither seem to be barn-burners. The Radeon Pro 455 is rated by AMD at 1.3 teraflops, and the Pro 450 is 1 teraflop. Because no one has actually seen these GPUs, it’s hard to say how fast they will be. That doesn’t mean I can’t try to guess. Apple said the new MacBook Pro 15 is 60 percent faster in gaming performance than the previous-gen laptop, which has a Radeon R9 M370X. 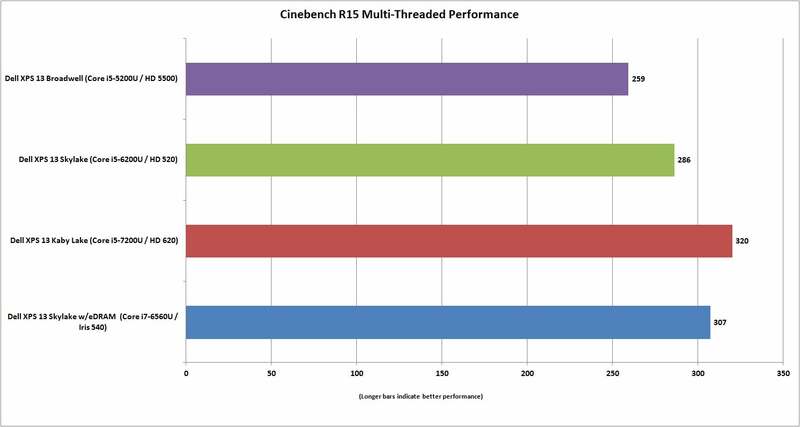 Taking the performance of that laptop (from a review by Notebookcheck.net) and adding roughly 60 percent, we can see how the new MacBook Pro stacks up against the current crop of PCs. If the new MacBook Pro 15 with its Radeon Pro 455 is 60 percent faster than the last-gen MBP 15, here’s how it would stack up against PCs. There are a lot of limitations to the estimated performance here. First, what exactly does Apple mean by “60 percent faster in gaming”? Is it in a certain game? Would the performance be worse or better in this one particular benchmark? Still, don’t expect the results to change much when we see the real deal. The best the MacBook Pro 15 could really hope to do is break even with the 1.3-teraflop GeForce GTX 960M. At least the Radeon Pro 455 does it while using almost half the power of the GTX 960M, but if you’re hoping for more raw horsepower, it won’t be there. Did Apple just kill your ability to upgrade the SSD? If those chips are soldered to the motherboard it did. In pure performance, the new $2,800 MacBook Pro might be a little faster in CPU loads and break even in GPU loads compared to a Dell XPS 15, which came out nine months ago and costs basically $1,400. 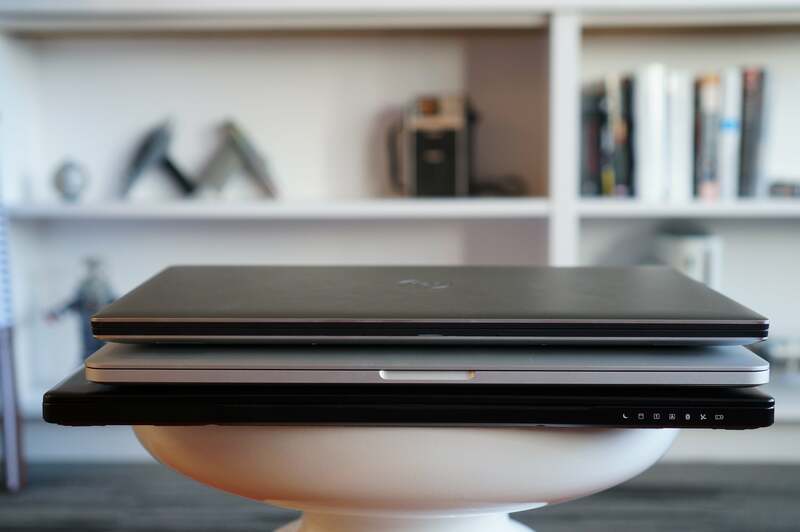 That particular Dell, of course, has a plain old 1920x1080 screen and an SSD half the size of the MacBook Pro’s, but in performance they might be the same. Throw in a 4K panel, larger battery, and SSD, and the Dell would still be cheaper. The problem for the MacBook Pro 15 is its weight class. At 4 pounds, it’s fair to compare it to the 4.1-pound MSI GS63VR Stealth laptop. Our review of the MSI is imminent, but it packs a quad-core Skylake CPU, 4K screen, 16GB of DDR4 RAM, 512GB SSD, 1TB hard drive, and a GeForce GTX 1060 card. Again, I don’t know how that Radeon Pro 455 will do, but glance up at the 4-pound MSI GS63VR on that benchmark chart and you can expect it to just about murder the MacBook Pro 15 in graphics performance. Here’s a Dell XPS 15 (top), last-gen MacBook Pro 15 (middle), and an MSI GS63VR Stealth (bottom). All weigh just about the same. Of all the new laptops, the MacBook Pro 15’s performance is most interesting. The MacBook Pro 13, by contrast, is a total yawner. Like previous generations, Apple relies on the faster Iris graphics-based Skylake chips. It doesn’t say what the specific parts are inside but it isn’t hard to isolate it to the dual-core Core i5-6360U and the dual-core Core i5-6267U. Here are the two CPUs in detail on Intel’s ARK. I say these are yawners because they deliver basically the same performance we’ve seen from PC laptops for the better part of a year now. The new MacBook Pro 13 should offer decent CPU performance that, in general, should be slightly better than the vast majority of PC Ultrabooks based on Skylake CPUs. That’s to be expected, as the MacBook Pro 13’s using the Core i5-6267U, a 28-watt CPU, vs. the 15-watt chips in most PC Ultrabooks. 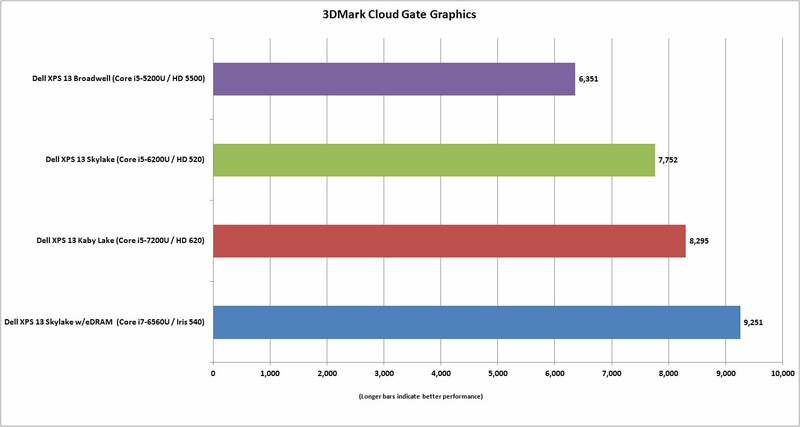 The new MacBook Pro 13 gets a nice boost from Iris 550 graphics—when compared to itself. Here’s what happens when you put them against the 7th-gen Kaby Lake Ultrabooks. Kaby Lake is basically an improved version of Skylake that runs at higher frequencies. It can do so for longer than Skylake, and it generally gives you about 10 percent more performance. I’m going to guess the MacBook Pro 13 might just about break even with some Kaby Lake laptops. The chart below includes an Iris 540 Core i7 Skylake CPU, which is actually slower than the Core i5 Kaby Lake in Cinebench R15 but that’s because it’s the 15-watt version of the chip. With the MacBook Pro 13’s higher wattage, it might exceed the Kaby Lake-based Dell XPS 13 you see here—or it might just break even. What I do know is it won’t be leaps and bounds ahead of the typical PC Ultrabook with a Kaby Lake CPU. The math just doesn’t add up for that. The 6th gen-based Skylake MacBook Pro 13 might break even with 7th gen-based Ultrabooks. 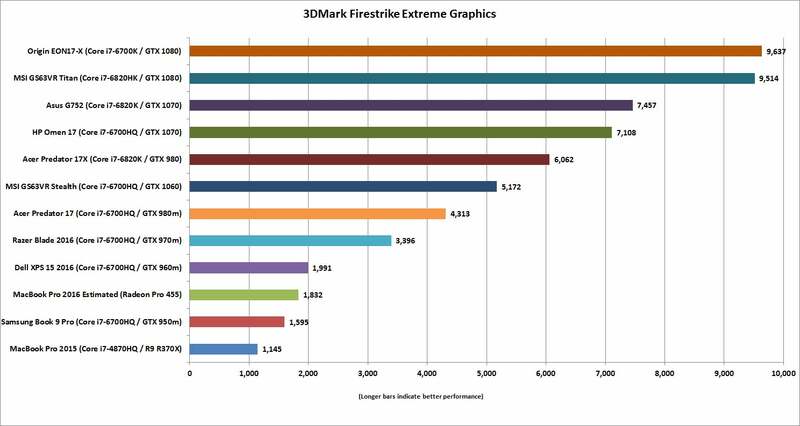 One area where the MacBook Pro 13 should have a nice leg up is in graphics performance. In the chart below, you can see the Iris 540 outpaces even the newer 7th gen. 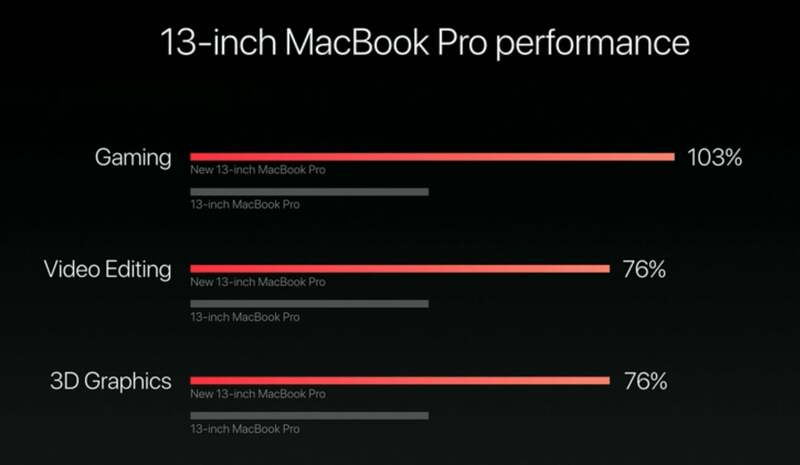 In graphics performance the MacBook Pro 13 should exceed the typical Ultrabook. Whether the MacBook Pro 13 prevails depends on what you think compares to the MacBook Pro 13. Microsoft certainly thinks its Surface Book i7 plays agains the 13-inch MacBook Pro. In fact, Microsoft specifically called out the old MacBook Pro 13 with its new Surface Book i7 announcement Wednesday, saying it would be “three times” faster than the old MacBook Pro 13. Although I’m disappointed with the Surface Book i7’s “upgrades” as well, I am almost certain it’ll easily hand the MacBook Pro 13 its hat as it kicks it out the front door into the snow. Microsoft has put a GeForce GTX 965m inside the Surface Book i7 this year, and that’s just spoiling for a fight. Frankly, I’m not even sure the MacBook Pro 15 can outperform the Surface Book i7 on graphics tasks (though it certainly will on CPU loads). In the end, after four long years and much anticipation, what we get with the MacBook Pro is performance that’s going to still lag the PC’s by a healthy margin. Let’s just hope it doesn’t take another four year for the next update. 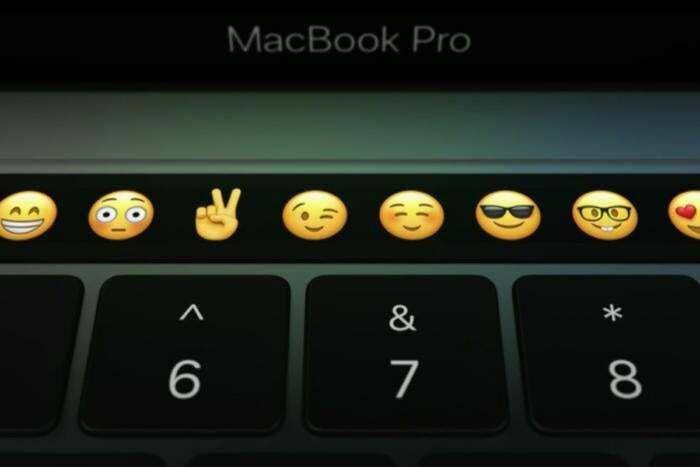 But hey, you get emojis in a tiny touch strip, right? There’s no pen or touch screen support but you can get emoji’s AMIRIGHT?